In front of the United States Geological Survey (USGS) national headquarters building in Reston, Va., two genetically identical lilac bushes are rooted in the earth. To casual observers, they are fragrant adornments to the landscaped property. But to ecologist Jake Weltzin and geographer John Jones—USGS scientists who study plant and animal life-cycle events—they are “Li” and “Lac,” two small but important pieces of a developing climate change indicator system. Weltzin is referring to the USA National Phenology Network (NPN)—a diverse registry of plants and animals across the United States that are closely monitored for behaviors and characteristics associated with seasons, such as bloom times, migration patterns, and reproduction cycles. The Network is primarily run and funded by USGS, with support from fellow bureaus of the Department of the Interior, the U.S. National Science Foundation, and partners outside of government. Li and Lac are enrolled in a particular branch of the Network that comprises thousands of genetically identical (cloned) and common (non-cloned) lilac bushes across the country. Lilacs are optimal candidates for this kind of research, called phenology—or, the study of nature’s calendar—because they are noninvasive plants, can be planted safely in many regions, and are highly sensitive to seasonal change. The use of genetically cloned plants is a strategic way to assure that observed differences in seasonally-relevant behavior (like bloom-times) are not the result of natural genetic variation. Li and Lac aren’t the only barometers of change on the USGS premises. On the roof of the headquarters building in Virginia, a small video camera works 24 hours a day, 7 days a week to capture near-continuous images of the forest canopy surrounding the building. This phenology camera, or “PhenoCam,” is a high-resolution digital device that records images of local-scale environments over time. Like the lilac bushes, the USGS PhenoCam is part of a National network of similar devices that gather information about environmental trends. Unlike the lilacs, however, which exhibit change on a plant-by-plant basis, the PhenoCams record information about trends at the scale of entire local landscapes and ecosystems (e.g., an entire forest). Together, the lilacs on the ground and the images from the roof pack a one-two punch of observational information for Weltzin and Jones, who use the combined streams of data along with satellite images to understand the characteristics of local change and their relationships to changes occurring at the regional and National scales. Put simply, phenology encompasses all critical events in the lives of plants, animals, and ecosystems that are linked to Earth’s climate—including when leaves fall, when flowers bloom, and when animals mate. But in addition to influencing the dynamics of animal populations and ecosystems, these phenological events also impact many elements of human society. For example, phenology sets the clock for events that are culturally and economically important, such as Washington, D.C.’s Spring Cherry Blossom Festival and New England’s autumn foliage displays—both of which are major tourist attractions. Phenology influences the decisions of farmers, who must carefully orchestrate planting and harvesting to maximize crop yields. And, it directly affects people with asthma and allergies by influencing the timing, duration, and intensity of pollen seasons. The study of nature’s calendar has been practiced throughout history, but the onset of rapid global climate change has made phenology research increasingly urgent. Weltzin explained, for example, that phenology data is needed to model and forecast the impacts of shifting seasons on societally relevant variables such as wildfire prevalence, length and timing of pollen seasons, and production of important crops. Impacts of shifting seasons are already being felt on the ground. Abnormally mild winter season temperatures in March 2012, for example, caused grapevines to bloom and fruit prematurely in some major grape-growing areas of United States. When frost hit those regions suddenly in April, vast swaths of grape crops were damaged. NOAA reported the loss of thousands of acres of the 2012 crop in Michigan and 50 percent destruction of the grape crop in Iowa as a result of the extreme seasonal temperatures. Research has shown that shifts in the length and intensity of warm-temperature seasons may also affect the prevalence and distribution of vector borne diseases; droughts, and wildfires—all of which have important consequences for the wellbeing of communities. Weltzin, Jones, and other phenology researchers are hoping to use data collected through the NPN and elsewhere to shed light on the evolution of these trends, improve forecasts of future conditions, and—perhaps most importantly—inform science-based decision making on the ground. For example, the NPN’s Juniper Pollen Project collects observational data on the timing of juniper plant pollen-releases and pollen concentrations across the country. Ultimately, this information will be used to improve allergen models that inform CDC’s Environmental Public Health Tracking Network and other tools that are used to track environmental health threats and hazards. Phenology data is also useful to resource managers, who “need timely, practical information about when best to conduct standard management practices such as mowing, flooding, burning, or applying herbicides,” Weltzin said. Like medical data, phenology data must be collected at multiple scales in order to inform decisions effectively. In order to understand how a disease manifests itself, for example, doctors often rely on both epidemiological studies—broad surveys of disease patterns across large populations—as well as individual, patient-by-patient case studies. Both kinds of information are needed to flesh out the full picture of a disease—including the trends happening across the country, and the effects of a disease on individual people. At USGS, Weltzin and Jones use a combination of methods to study phenology at multiple scales. For the macro view, teams of scientists gather and analyze data from high-tech systems like PhenoCam networks, weather monitoring systems, and satellite sensors. 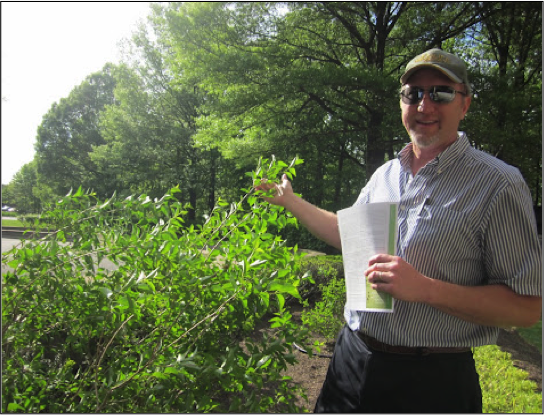 For the micro perspective, they collect on-the-ground observations of plants and animals– including the lilac bushes at USGS. Synthesis of this multi-scale information creates a more detailed picture of how and when seasonal changes occur. John Jones describes his work at USGS as “map-making with satellites and cameras.” His goal is to understand how elements of the environment change and interact across both space and time—a task that involves piecing together clues from various sources, regions, and time periods. That’s why this past March he installed a new PhenoCam on the USGS rooftop in Virginia. The camera points north (to reduce sun glint and shadow effects) toward the Reston Town Center nearly one mile away. The device captures images of the woodland areas surrounding USGS at 30 minute intervals and posts them to the internet in near-real time. “The idea is that taking pictures at the same time each day and capturing images from the same vantage point will help normalize for lighting effects and other variables,” Jones explained. The stream of images taken by the PhenoCam will be pieced together to create an animated, flip-book-type visualization of the changing landscape. The camera captures an array of phenomena—from buds blooming, to leaves greening, to leaves falling. Jones admits that these snapshots, while useful and often beautiful, aren’t sufficient to obtain the macro-scale perspective needed for robust analysis. That’s why imagery from the PhenoCam is juxtaposed with satellite images of the same location and topography. It’s also why images from second USGS PhenoCam stationed in Virginia’s Shenandoah National Park are overlaid with data from surrounding weather stations. The added information helps provide context for when and why the phenological changes captured on camera are occurring, and can help scientists directly assess the relationship between seasons and temperatures in a specific place. “Weather stations help us untangle information from visuals collected through the PhenoCams,” Jones explained. The juxtaposed “macro” images are quite revealing. Scientist can use them pinpoint whether a forest lost its leaves earlier than usual in a particular season, for instance. What one can’t get from these macro images, though, is a sense of the changes occurring on the ground, on a plant-by-plant level. That’s where the lilacs come in. Doctors around the world have been collecting and publishing case studies of individual patients for hundreds, if not thousands of years. These contribute to a large body of micro-scale work that the health community can use and learn from. Phenologists require the same kind of micro-scale information about seasonal change and life-cycle events for specific plants and animals, in specific regions, at specific times. Scientists and naturalists throughout history have documented these kinds of changes, including well-known nature-lovers like Thomas Jefferson, Henry David Thoreau, and Lewis and Clark. But historically, documenting these kinds of observations has often been more of an art than a science—with little effort made to systematically collect and integrate them across many scales of space and time. For the relatively small community of phenology researchers seeking this type of information, such a vast effort would be impossible to tackle alone. Fortunately, phenology researchers haven’t backed down from the challenge. Instead—“we engage citizen-scientists as data collectors,” Weltzin said. So far, nearly 6,000 citizen-scientists across the country have registered as observers through the NPN citizen observation program called “Nature’s Notebook”— an online database where members of the public can document routine observations of plants and animals in their own backyards or local parks. About one-third of registered observers have contributed data so far, including observations from every state in the Nation. Nature’s Notebook provides some basic training on how to observe and record phenology data, and thus helps average citizens become true participants in the scientific process. Newly minted citizen-scientists like Portland resident Lucille Tower, who joined the NPN in April 2012 and a month later submitted the Network’s millionth observation, are actively providing researchers with far more data than they could collect alone. NPN receives thousands of nature observations each day from its growing army of enthusiastic data collectors— most of which would not otherwise be obtainable by scientists working alone. Notably, the number of observations recorded and submitted to the NPN by citizen-scientists has surged since early spring of 2012. Weltzin attributes this spike in interest to this year’s unseasonably warm springtime weather, which citizens may have sought to understand and document. “This spring, people started going crazy as they observed such an early spring, and were very eager to participate in our efforts to learn more about what’s happening,” he said. In the first five months of 2012 alone, 270,000 records were entered in the NPN—compared to 380,941 during the entire year of 2011. In the spring of 2012, several thousand records were submitted each day. Then, in May, the Lucille Tower helped the NPN reach its million-observation milestone. “Scientists — both citizen and professional alike — are increasingly recognizing the impact of shifting seasons on our Nation’s economy, ecosystems, and health,” Weltzin said. Weltzin and Jones plan to continue using every tool at their disposal— including satellites, cameras, and lilac bushes— and harnessing the eyes and ears of citizens to understand how climate change is shifting nature’s calendar. The data they collect and analyze will help scientists better understand and predict seasonal changes, and will ultimately help improve models and tools that support decision makers across the country. Tara Failey wrote this article while interning with USGCRP in the Summer of 2012. She is currently an MPH student in Environmental Health Science and Policy at The George Washington University.